I have developed code to label points that pull formatting from a dictionary. I developed this code and it was working fine two weeks ago, today I try to open my map and I am now met with an error which I can't seem to trace in the code. Do you have any suggestions for finding/fixing this error? I've already restarted my computer and application thinking the glitch may not be in the code (as it was working fine just a few weeks ago). I am using ArcMap 10.6 and havent changed recently. However my python updated on March 4th from 3.7.2 to 2.7.16... maybe this new version has an issue with numpy? Thanks for everyones input! Turns out Python updated (automatically), and the new version was either corrupt or didn't install right. I tried reinstalling ArcGIS, and also repairing it with no luck. After contacting ESRI Tech Support, they recommended step 4 of this article : Problem: Unable to import arcpy I had to manually delete the ArcGIS10.x folders under C:\Python27 before running the installation tool to Repair. Not the answer you're looking for? Browse other questions tagged arcgis-desktop arcmap labeling python-parser numpy or ask your own question. Avoiding ImportError: No module named numpy? 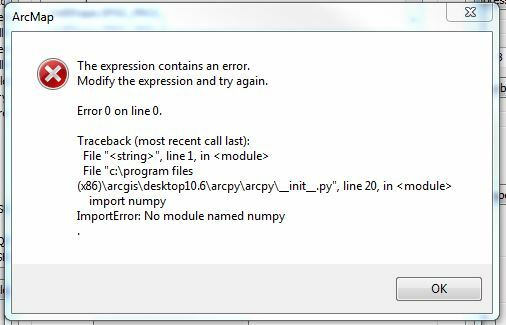 ArcGIS Raster Calculator error 000539 ImportError: No module named numpy? Maplex Label Expression in Python Parser of ArcGIS for Desktop? ArcGIS Issue with Python wildcard in Label Expression?